It is very interesting to note that movies which consider architecture as an essential element of the film fall under two categories, fantasy and futuristic. Though people may argue that futuristic movies are quite similar to fantasy ones, we have to admit that futuristic movies are made with much more scientific reasoning and backing and surprisingly the architecture elements of such films are generally derived from the past. We have seen how many of the futuristic movies take inspiration from the fascist architecture styles of the Nazi or Soviet era. But here is one movie based on a futuristic story line which has chosen to ignore this clichéd architectural representations and have gone for a much more simplistic approach (After all, Less is More). Christopher Nolan’s 2014 Science Fiction film Interstellar tells the story of a crew of astronauts who travel through a wormhole in search of a new home for humanity. The incredibly talented star cast of the movie include Matthew McConaughey, Anne Hathaway, Jessica Chastain, Casey Affleck, Bill Irwin, Ellen Burstyn, Mackenzie Foy, John Lithgow, Michael Caine and Matt Damon. Christopher Nolan had revealed in television interviews how he would have chosen architecture as an alternative career option. He had demonstrated his knowledge in the domain of architecture earlier in movies like Dark Knight Series and Inception. His approach has always being quite simplistic and grounded to reality, whether it was designing the city of Gotham in Batman movies or the spherical futuristic abode of humans in Interstellar. So, many of you might be wondering what is there to talk about if the architecture style in the movie is quite simplistic and real. Well this is where we should not underestimate a man of Christopher Nolan’s calibre. 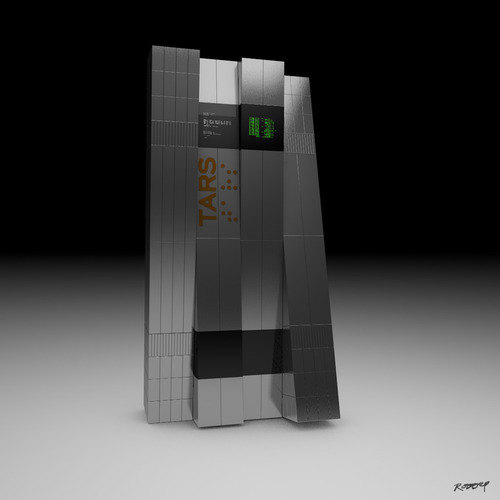 First let us discuss about the articulated machines present almost throughout the movie – The sleek grey acerbic robot named TARS (Voice by Bill Irwin). These rectangular slabs of shiny metal that walk, talk, have a sense of humour and operate like a cross between a Swiss army knife and an iPhone. Their blocky fragments can disconnect and rotate to perform a variety of actions, from pushing buttons to cart-wheeling across alien planets. It also relates strongly to the architecture style of Mies van der Rohe, widely regarded as one of the pioneering masters of modern architecture along with Frank Lloyd Wright and Le Corbusiner. Nolan explained in an interview how he honed in on the idea and asked the art designer of the film, Nathan Crowley who is a very big fan of modern architecture, “What if we designed a robot as if Mies van der Rohe designed a robot?” We can see how the machines of the movie are quite different from the anthropometric robots that we generally see in fiction (Like C3PO and R2D2 from Star Wars). One of the most fascinating yet confusing part of the movie is the scene involving the Tesseract. (Spoiler Alert!) This appears when Coop (Matthew McConaughey) jumps from the space craft and is drawn into a black hole. 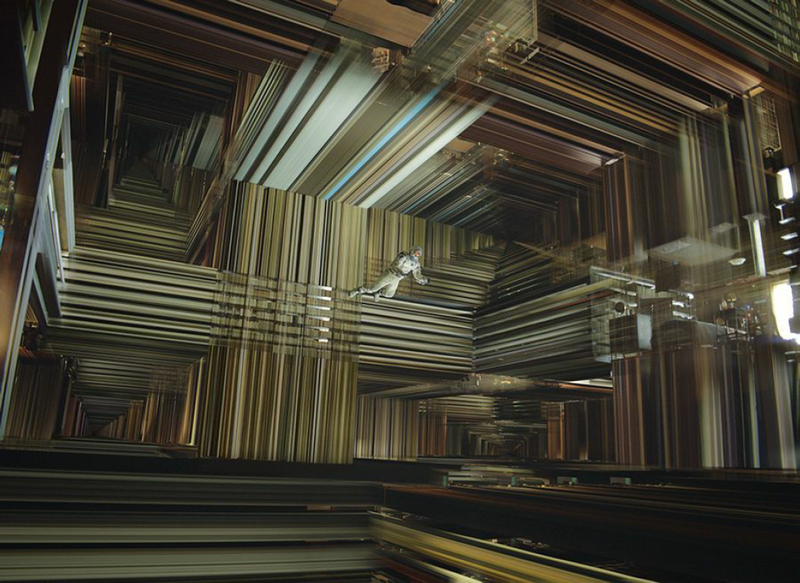 Inside this black hole Nolan envisages an Escher-like architectural structure representing a single moment in time – the scene in which Coop leaves his daughter. 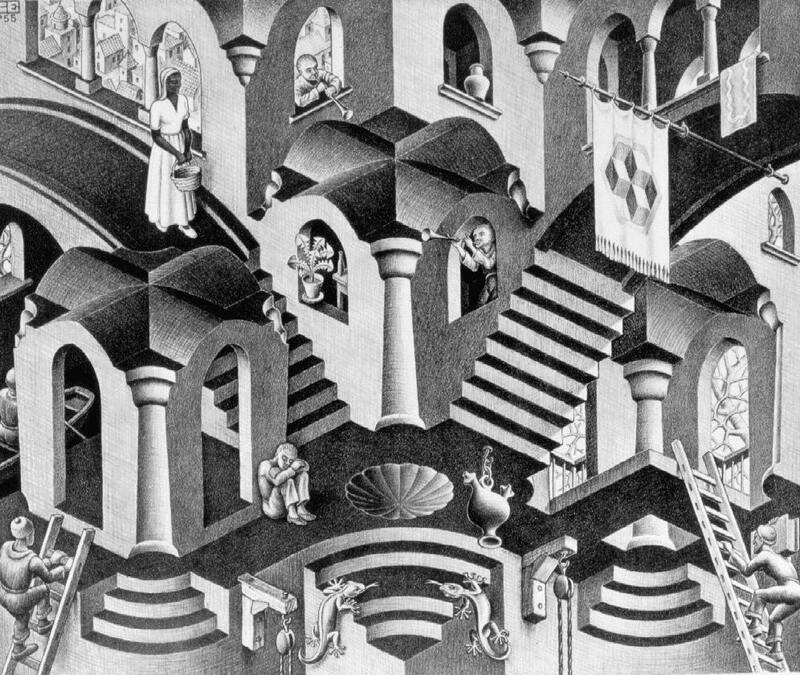 Maurits Cornelis Escher is a Dutch graphic artist known for his often mathematically inspired woodcuts, lithographs, and mezzotints which feature impossible constructions, explorations of infinity, architecture, and tessellations. Most of the other architectural features in the movie like the spaceship, the travel pods, and the station of Dr Mann (played by Matt Damon) are based on real scientific elements and have also taken inspirations from classic science fiction movies like 2001 Space Odyssey. These spaces focus more on functional aspects. Even the futuristic abode of humans shown at the end of the movie is quite simplistic from an architectural point of view. Most of the buildings shown are similar to any modern day buildings we find around us. Be it the houses near which the kids play baseball or the interiors of the hospital where Coop meets his aging daughter, Murph. Of course the shape of the terrain and the play of gravity makes them look fascinating. Overall we can say that Christopher Nolan has tried to provide a simplistic treatment to the architecture elements in the movie. Considering the already complicated plot and scientific elements in the movie, we can assume that he wanted the buildings to be as near to present day structures as possible. These simplistic elements help make the movie easy to relate to for the audience. It the first time, I see such an awesome post about architecture in cinema. The images you used are really inspiring. The script and a great director together cause an architect to become more creative. It conveys a great message that an ordinary designer can be an architect if he becomes a part of film production.